During the festive season, there are many different seasonal plants on offer at most garden centers. They add a lovely touch to your seasonal decorating theme and can be carried over as houseplants from year to year. Two seasonal plants that I love are cyclamens and Christmas cactus. Both of these make fabulous indoor plants and give a lot of color to your decor during the cold winter months. 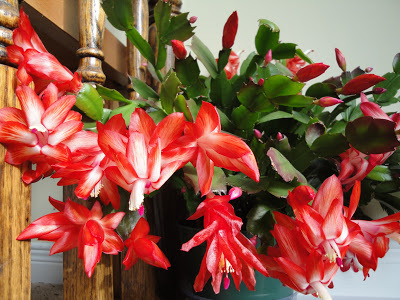 One of my favorite seasonal plants is the Christmas Cactus. I have two of them that bloom each year about this time. I divided one big one and now have double display of the pretty flowers. I just love the trumpet shaped flowers. I also just added a third one which was one of my mother’s who recently passed away. It is lovely to know that it will bloom around the time of her death each year. The plant is so easy to push out blooms in the late fall. I keep it outside all summer long in a semi shady part of my garden. I don’t bring it until until the temperatures start to get close to the freezing point over night. The short days and cool temperature sets the buds and gives me a wonderful holiday display. The plant is also very easy to root from pieces of the stems to get new plants. 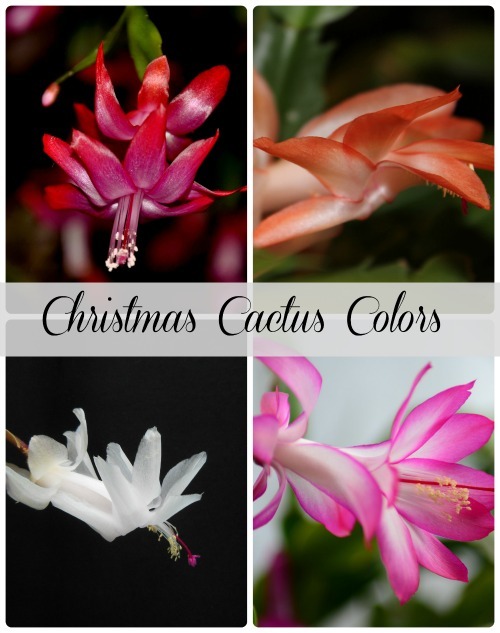 The Christmas cactus is often seen this time of the year in bright red colors, but red is not the only color for the plant. It comes in various shades from pink, peach through to white flowers. 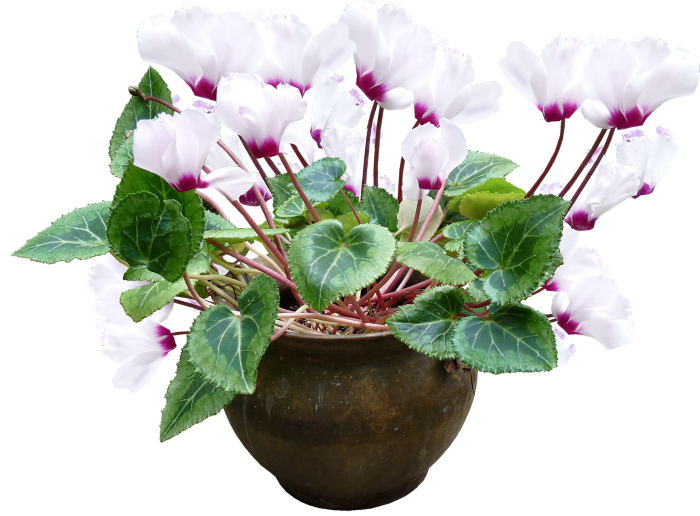 Another of my favorite seasonal plants which comes around this time of the year is a Cyclamen. I haven’t seen one yet this year, but remember that my mother had one on display most Christmas seasons. I remember that I always loved the glossy leaves and pretty purple flowers. I think I like the leaves almost as much as I do the blossoms. Cyclamens are also cool loving plants and do well even in north facing windows. 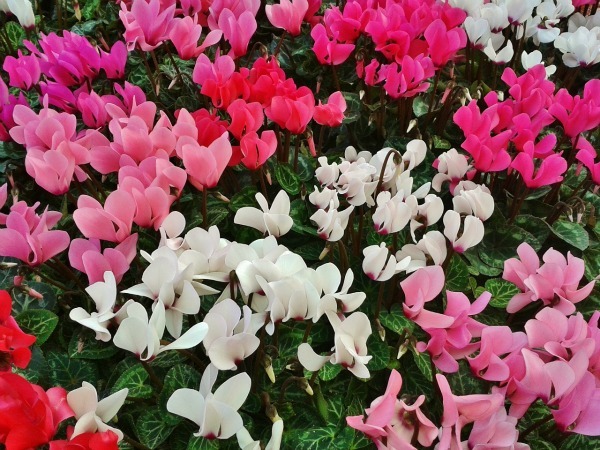 The care of a cyclamen starts with the right temperature. If you keep your house warm, (above 68º F during the day and over 50º F at night, it will start to slowly die. Cyclamens also come in a variety of colors. After blooming, the plant goes into a dormant state. It is not dead at this point, just resting. Place the plant in a cool dark place for a couple of months, withhold watering and you may be rewarded with more blooms later. Here is a YouTube video from the University of Illinois Extension showing how to care for the festive plant. Do you have a favorite holiday plant? Do you try to keep seasonal plants flowering during the year, or do you just use them as an accent plant at Christmas time? I’d love to hear your comments in the comment section below. Who would not want these two beauties to be blooming indoors this holiday season?